A paper published today in Environmental Research Letters has very important implications for tree-ring paleoclimate research [dendrochronology], including Michael Mann's debunked hockey sticks. The paper finds that growth of bristlecone pines varies significantly depending on altitude, and also depending on whether the trees are located on the North or South side of a mountain. According to the authors, such differences are often not temperature-related and thus could contaminate tree-ring datasets for which the false assumption is made that tree-rings accurately reconstruct temperature variations. "Treeline site chronologies should be constructed with this vertical heterogeneity in mind. Samples from upper treeline and from trees below treeline should not be mixed to avoid a 'diluted' or 'mixed-signal' site chronology, particularly at treeline sites that occur in relatively dry environments such as the White Mountains of California. Similarly, treeline samples from differing aspects should not be mixed to avoid problems and uncertainties related to potential 'divergences' and to 'dilution'. Interpretations of existing bristlecone chronologies need to take this into account, particularly when these ring width chronologies are used in climate reconstructions. Furthermore, bristlecone pine dendroclimatological research would benefit from the pursuit of mechanistic studies of bristlecone radial growth and from directly measured temperature and moisture variability in high alpine environments. Such research would help to more accurately describe the species response to climate variability." And tree-ring data from different sites "should not be mixed to avoid a 'diluted' or 'mixed-signal' site chronology, particularly at treeline sites that occur in relatively dry environments such as the White Mountains of California. Similarly, treeline samples from differing aspects should not be mixed to avoid problems and uncertainties related to potential 'divergences' and to 'dilution'. Interpretations of existing bristlecone chronologies need to take this into account, particularly when these ring width chronologies are used in climate reconstructions"
Bristlecone pines located at a mountaintop treeline can show an apparent hockey stick, but 60-90 meters downslope the hockey stick disappears. And guess which data Mann's flawed statistical methods selected? 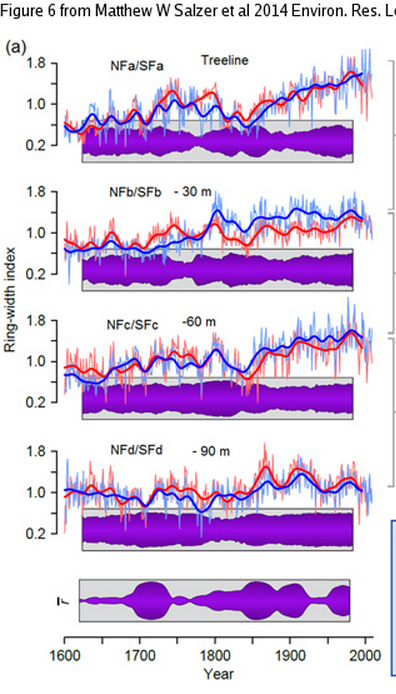 Tree-rings showing hockey sticks only. This new paper is a huge thorn in the side of the field of dendrochronology and could invalidate decades of prior research, especially including Mann's hockey sticks which rely heavily upon bristlecone pines. The authors recommend in the future no mixing and matching of tree-rings from different sites, and "directly measured temperature and moisture variability in high alpine environments. Such research would help to more accurately describe the species response to climate variability." Dendroclimatology relies on networks of sites that represent approximations of the shared temporal variability found in collections of tree-ring samples from a particular location (Fritts 1976, Hughes 2011). Sites are areas thought to be similar with respect to the factors determining the climate control of tree-ring variability. The site principle relies on a common signal among all of the samples contributing to the site chronology due to their like responses to the same growth-limiting factor(s). We have shown that approximately 60–80 m of vertical elevation can be sufficient to create a change in the climate response of bristlecone pine. Trees below this elevation are not as effective temperature recorders as trees at treeline. Such fine-scale sensitivity, if present at other treeline sites around the world, would have important implications for chronology development and inferences of past climate variability. Treeline site chronologies should be constructed with this vertical heterogeneity in mind. Samples from upper treeline and from trees below treeline should not be mixed to avoid a 'diluted' or 'mixed-signal' site chronology, particularly at treeline sites that occur in relatively dry environments such as the White Mountains of California. Similarly, treeline samples from differing aspects should not be mixed to avoid problems and uncertainties related to potential 'divergences' and to 'dilution'. Interpretations of existing bristlecone chronologies need to take this into account, particularly when these ring width chronologies are used in climate reconstructions. Furthermore, bristlecone pine dendroclimatological research would benefit from the pursuit of mechanistic studies of bristlecone radial growth and from directly measured temperature and moisture variability in high alpine environments. Such research would help to more accurately describe the species response to climate variability. Millennial-length bristlecone pine tree-ring chronologies are an extremely valuable paleoclimatic resource. New studies that emphasize the importance of precise individual tree location and the measured physiological response of these trees to quantified local values of temperature and moisture will be a step toward using these archives to their full potential. In the White Mountains of California, eight bristlecone pine (Pinus longaeva) tree-ring width chronologies were developed from trees at upper treeline and just below upper treeline along North- and South-facing elevational transects from treeline to ~90 m below. There is evidence for a climate-response threshold between approximately 60–80 vertical m below treeline, above which trees have shown a positive growth-response to temperature and below which they do not. Chronologies from 80 m or more below treeline show a change in climate response and do not correlate strongly with temperature-sensitive chronologies developed from trees growing at upper treeline. Rather, they more closely resemble lower elevation precipitation-sensitive chronologies. At the highest sites, trees on South-facing slopes grow faster than trees on North-facing slopes. High growth rates in the treeline South-facing trees have declined since the mid-1990s. This suggests the possibility that the climate-response of the highest South-facing trees may have changed and that temperature may no longer be the main limiting factor for growth on the South aspect. These results indicate that increasing warmth may lead to a divergence between tree growth and temperature at previously temperature-limited sites. I liked this line in the full text of this paper, "While this trend continued through the 21st century for the NFa chronology, growth rates in the SFa chronology have declined in comparison to NFa since the mid-1990s, and have become more similar to the non-treeline chronologies downslope." Too bad Dr Mann's chronology for the HockeyStick means Sweet-F-All. I suppose to be polite, I should have said "Sweet Frack All". The study said "We have shown that approximately 60–80 m of vertical elevation can be sufficient to create a change in the climate response of bristlecone pine. Trees below this elevation are not as effective temperature recorders as trees at treeline." So Mann just says "Good thing we used the right bristlecones - the ones that are effective temperature recorders."